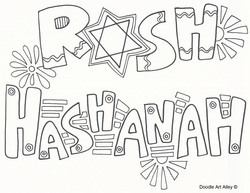 Rosh Hashanah is the Jewish New Year. It is a two day celebration including eating symbolic foods and sounding the shofar (a hollowed-out ram's horn). The day is believed to be the anniversary of the creation of Adam and Eve, the first man and woman, and their first actions toward the realization of humanity's role in God's world. Rosh Hashanah is celebrated in September or October.